Background: Lisa and I had been to London four years ago and hit the major tourist sites. However, we didn’t visit St. Paul’s Cathedral or Westminster Abbey, saving it for another time. That time was now. Also, after watching the movie “Darkest Days” and learning more about Winston Churchill through our background reading on World War II, we also wanted to tour the Churchill War Rooms. Total cost to visit would cost 57 pounds, approximately $76. We arrived at 8:50am and there was already a line of about fifty people. They opened the doors early at 9:25am and the line went quickly. We paid with our cards, received our audio phone guides, and started our tour just after 9:30am. The audio tour only took an hour, and we spent another half hour visiting other areas of the Abbey. Less than a ten-minute walk from Westminster Abbey. This place is pretty cool! There is a huge museum section devoted entirely to Churchill’s life, which we just kinda skimmed over because there was so much that was very in depth. Corridors got pretty crowded and it made for a little slow going inside. We left at around 1pm. Took the Tube from Westminster to the cathedral and had a short walk through the lunch time crowds lining the sidewalks. Used our audio guide phone devices to tour the ground floor, the upper galleries and the crypt. We walked up 528 steps! But the views were incredible, walking all that way up is well worth it. Our tour started at 4:30pm and lasted for maybe 20 minutes. Kinda lame, especially since our group of eighteen had three annoying pre-teen kids that were a little too rambunctious and the three different actors had to give them a warning for their behaviors. Basically, we go from room to room to learn about some historical aspects of the London Bridge. When that was finished, we were led to the “Tombs,” which is basically a typical Halloween haunted house. This part was pretty well done, and Lisa even survived it. However, when we finished with the attractions it was already past 5:00pm — the problem with this is that most of the London Pass attractions close at 5:00pm! 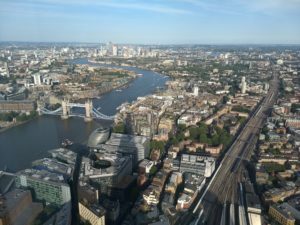 Forget the London Eye, this is the place to get high high up in London — 72 floors up! We spent a long time admiring the views from all sides and taking a bunch of photos. We walked for a good 30 minutes from the Shard along the Thames, over the Tower Bridge, and caught the last boat of the evening at 7:35pm. Rode it to Westminster Abbey and from there we just walked back to our hotel at Leicester Square, arriving back to our hotel at 8:30pm, almost exactly twelve hours from when we left for the Abbey. For just $7 more, we were able to squeeze in the London Experience, do the Shard and take a scenic boat tour with commentary. If we really wanted to, we could have also used our London Pass to see a first-run movie at a movie theater, but opted not to. These are attractions that we would probably never do — however, with the London Pass, it’s a great opportunity to throw in some extra fun. Did our day with the London Pass feel rushed? No, not necessarily. Reviews warned us that we could spend an entire day in the Churchill War Rooms, so we were careful to be selective about what we saw there. The rest of the places we took our time. Is there an attraction that we wanted to go to, but didn’t have the time? We’ve never done one of those Hop On/Hop Off bus tours, and the London Card includes the routes of one of two companies. Sadly, the last one running its full loop started just after 6pm and we were much too far to get it. Normal price for these outfits is spendy at 33 pounds per person, or about $44. Well worth it if you are able to prioritize the places that you want to go and plan on the locations being in reasonable proximity to one another. It wouldn’t make sense for someone to buy this pass, go all the way to see the Windsor Castle and then come back the same day to tour other attractions that have huge lines. Like I said, many places close by 5pm and they rarely open before 9:30am, so you really just have a small window o eight and a half hours to hit up the main attractions, including the Tower of London. We did visit the Tower four years ago, and it took a good three hours for us to check it all out. 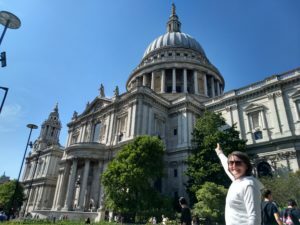 All in all I think we did a pretty good job of maximizing our London Pass to see the things we wanted to see, plus three more things that were fun that we wouldn’t ordinarily do as a standalone attraction. And with the online discount from 69 pounds to 62 pounds, it just make financial sense for us to try and do as much as we could for just a few dollars more versus buying them as standalone attractions.